At each of the past two Star Wars Celebration conventions, Lucasfilm’s Dave Filoni and Pablo Hidalgo opened the company’s metaphorical vaults to share the previously hidden secrets of Star Wars animation. In 2015 at Anaheim, “The Clone Wars Tales Yet Untold” offered inside information from production, along with glimpses at concept art and story reels, for many of the episode arcs conceived for the animated series but never developed to final animation. In 2016 at London, “Ahsoka’s Untold Tales” did the same for the three story arcs centered around Tano’s character after her departure from the Jedi Order at the end of season five. 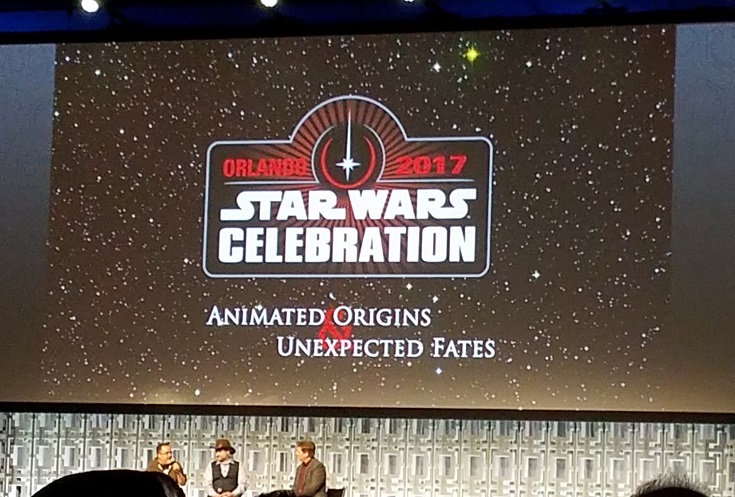 For this year’s convention in Orlando the focus shifted to the secrets of Filoni’s second animation triumph for Lucasfilm, Star Wars Rebels. Titled “Dave Filoni: Animated Origins and Unexpected Fates,” the panel considered six characters whose stories earned those descriptors. Fresh off his demise – apparently meant to stick this time – in “Twin Suns,” the penultimate episode of Rebels’ third season, Maul earned first billing. Filoni began by briefly reminding the audience about the inception of Maul’s return in The Clone Wars. The idea that Darth Maul had survived his seemingly decisive bisection in The Phantom Menace would never have been pursued if it hadn’t been initiated by George Lucas while the Nightsisters arc in Season Three was in production. Lucas, though, desired to take the story of Savage Opress even bigger, and Maul delivered on that notion. The famous spider legs serving as the lower half of deranged Maul, symbolic of the madness generated by his obsessive dark vengeance toward Kenobi when Savage first finds him on a junkyard world, also came from Lucas. The focus of the discussion then turned to Maul’s fateful reunion with Kenobi amid the sands of Tatooine, with the ongoing conversation illustrated with Hidalgo sharing Filoni’s storyboards of the confrontation and lightsaber duel. Filoni confirmed his perspective agreed with many fans, that Kenobi deserved the role as the one who brings an end to Maul’s revival. 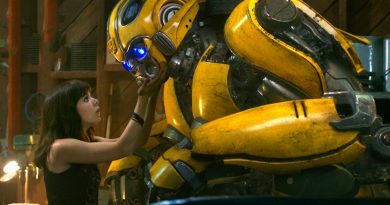 Not only does it avoid undercutting the importance of his initial movie victory in The Phantom Menace, but it also provides powerful thematic closure to both of their character arcs. Despite a second chance at life, Maul sadly proved unable to achieve personal growth; to the end he remained fixated on power and revenge. Kenobi, by contrast, has become a true Jedi Master. His swift dispatching of Maul reflects the depth of his knowledge of the Force and his adversary, but also his commitment to mercy. Filoni noted that if Maul had not come to Tatooine and figured out why Kenobi was there, Kenobi would not have tracked down the former Sith Lord to end him. After all the pain Maul had caused him, ultimately Kenobi has forgiven him – and when he realizes Maul is incapable of moving on, he does what is necessary. As usual, Filoni connects everything back to the core needs of the story. He revealed that an early version of “Twin Suns” was 35 minutes long, and had to be trimmed to fit the 21 minutes run-time of a Rebels episode. Part of what had to be removed was a subplot back at the rebel base, showing Kanan and Hera dealing with the reality that the two youngsters in their chosen space family are growing up and moving on to bigger roles. Remnants of this storyline remain in Kenobi’s wisdom to Ezra that the young man already has what he needs to defeat evil, and Ezra’s affirmation of the importance of his family upon his return to Atollon. Additional content trimmed from the episode included Maul’s hallucinations in the desert while seeking Kenobi, including apparitions of Savage and Duchess Satine. While these overt connections to The Clone Wars would have been powerful for some viewers, Filoni emphasized that Rebels has to work for all viewers, including the audience for whom Rebels is their first exposure to Star Wars. The need to keep the episode centered on the story of Rebels – and the lesson needed to be learned by Ezra in “Twin Suns” – required sacrificing the backstory nods in favor of the denouement earned by Kenobi and Bridger in finally finishing off Maul. The discussion then turned to two characters from The Clone Wars who garnered unexpected fates far beyond their initial conception: Rex and Ahsoka. 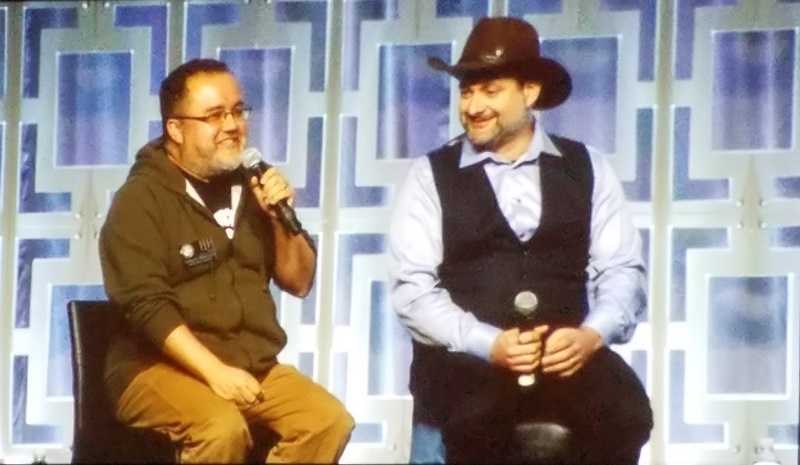 Filoni acknowledged his surprise at how popular the clones became with the fans over the course of the series, and praised voice actor Dee Bradley Baker for his contribution to their personalities and appeal. Hidalgo noted that George Lucas had left notes about the ultimate fate of the soldiers of the Clone Army, indicating that they would become a discarded generation because their years of service alongside the Jedi had made them too independent to remain part of the tyrannical military of the new Galactic Empire. Filoni used that notion in creating the retiree fishermen clones in Rebels, giving Rex, Wolffe, and Gregor a chance to live on far beyond the gaze of the Imperial war machine. At the Rebels press conference, Filoni elaborated on Rex’s role in the new series, describing him as a good and honorable soldier who, with the Ghost crew and Rebel Alliance, is for the first time fighting for a cause he actually believes in, rather than one he was programmed for. A glimpse of Season Four concept art for Rex hints that the old captain may not have seen his last days of combat on the front lines. With her tales from The Clone Wars previously revisited and her fate in Rebels still mysterious, Filoni reached back to Ahsoka’s initial origin when the show was first being developed. 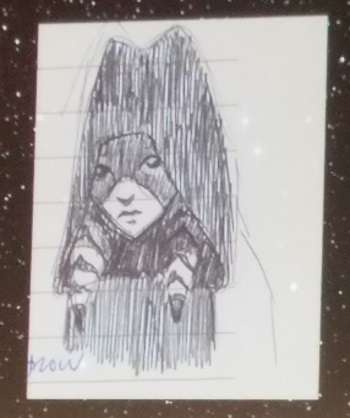 Hidalgo unveiled the first sketch Filoni ever made of the young Togrutan apprentice to Anakin Skywalker. 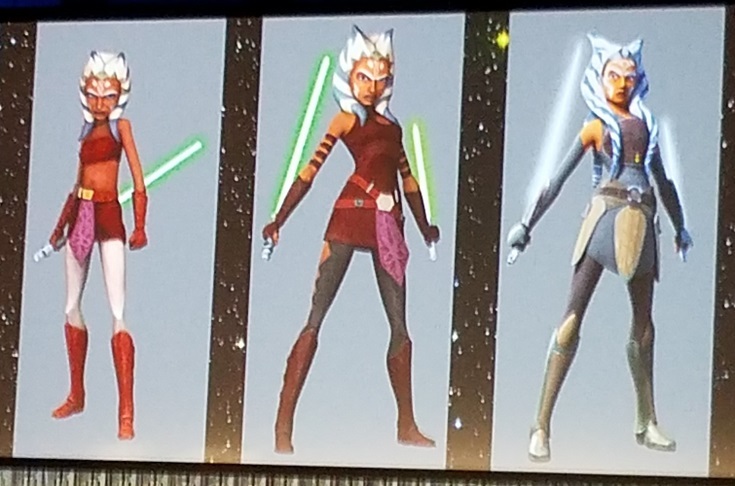 Comparing her two models from The Clone Wars and her model from Rebels, Filoni remarked that her Rebels appearance is his favorite, especially the white lightsabers, and joked that she made “progressively better fashion choices” over time. Filoni also explained that he had been interested in the Ahsoka novel as a way to see if she could stand with the classic characters in supporting stories in multiple mediums, and he was thrilled by the tremendous fan response to the book. Although he refused to share specifics, he admitted that Ahsoka still has more to come onscreen. Next the panel examined two characters with animated origins who crossed over into the feature films in Rogue One: Chopper and Saw Gerrera. Hidalgo reaffirmed the Story Group’s goal of keeping all of Star Wars connected, while Filoni expressed his gratitude that Gareth Edwards and the team at ILM had wanted to include Chopper and the Ghost from Rebels in the movie. 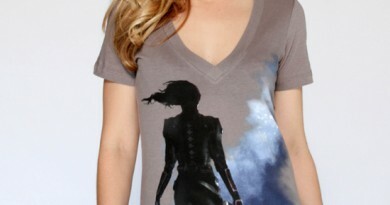 Likewise, early in the development of Rogue One it became clear that Saw was a perfect fit for the radical rebel leader envisioned for the story. Constant contact through Story Group leader Kiri Hart enabled Rogue One and Rebels to synergize their portrayals of the character, taking him from his last appearance in Season Five of The Clone Wars to an extremist commander in Season Three of Rebels to the physically and mentally damaged outcast seen in Rogue One. Saw will return in Season Four of Rebels, bridging the connection even further. To conclude the panel, Filoni and Hidalgo circled back one more time to The Clone Wars and an unfinished story arc holding great interest for many fans. The arc shows Cad Bane mentoring young Boba Fett in the ways of the bounty hunter. Filoni reminded fans that initial ideas for the series used the bounty hunter Durge from the Expanded Universe telling of the war, but as the character’s role continued to develop a new character was created instead. Filoni expressed his preference, continuing into Rebels, that a Legends character should only be used true to who they already are in those stories, not using a familiar name if it does not reflect that origin. 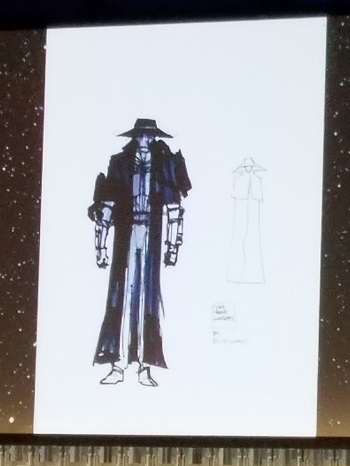 While Hidalgo showed concept art of various possibilities for Cad Bane, Filoni explained that George Lucas made the suggestion for a cowboy modeled after Lee Van Cleef, very much how the final model of Cad Bane ended up. Filoni then shared a never-before-seen clip from the arc, a gunslinger’s showdown between Cad Bane and Boba Fett straight out of a Sergio Leone Spaghetti Western – that reveals George Lucas’ idea for the origin of the famous dent on Fett’s helmet. With so much content to share, the panel ran out of time for Q&A. Though with the number of children in attendance, this probably spared Filoni the need for repeated awkward evasions of earnest questions about the still-secret fates of numerous favorite characters. While the next Celebration convention has yet to be announced, fans can hope that Filoni and Hidalgo offer another edition of their panel series in the years ahead.